Elliott Yeo was magnificent for the Eagles, finishing with 36 disposals, 24 contested possessions, nine inside 50s and nine tackles. Jack Redden was fantastic also, totalling 32 disposals, 12 marks, eight score involvements and a goal. In a pulsating contest, the Eagles ran over the top of Collingwood, kicking 5.3.33 to 1.1.7 in the final term. All five goals came via intercept possessions as they converted 20 intercept possessions into 5.1.31. West Coast has kicked 4.3.27 to 1.1.7 on the back of dominating contested possession 41 to 27, including 33 to 19 in ground ball gets. The Eagles have enjoyed almost two and a half more minutes time in possession this quarter. Collingwood has gone at 72 per cent by foot for the quarter compared to West Coast's 50 per cent. Eagles InterchangeChris Masten off due to the blood rule. 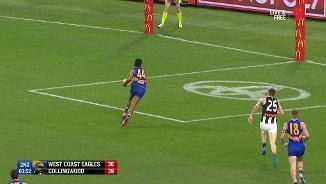 Eagles InterchangeWillie Rioli off due to the blood rule. Magpies InterchangeLevi Greenwood off due to the blood rule. Elliott Yeo has a remarkable 24 contested possessions for the match, well and truly eclipsing his previous careerhigh of 19 contested possessions set in Round 19, this year against North Melbourne. West Coast leads contested possession 16 to eight, including 15 to five in postclearance contested possession and tackles six to one for the quarter. West Coast are pressing hard. They have five of the first seven inside 50s for the term and have kicked both of their goals via defensive half intercepts possessions. Elliott Yeo has been impressive for West Coast this evening. He leads all comers in both disposals with 28, contested possessions with 18 and inside 50s with eight, while also laying an equal match high seven tackles. 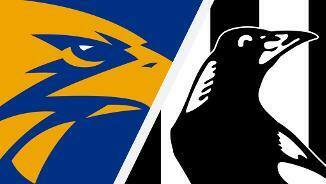 West Coast will need a big final quarter, trailing the Magpies by 10 points at three quarter time. The Eagles have won 15 of 22 final quarters this season, ranked third in the competition. Collingwood has won 13 of 22 final terms, ranked sixth. The Eagles have won nine of 12 final quarters at Optus Stadium this season. Collingwood has kicked 6.6.42 from 57 intercept possessions while West Coast has kicked only 4.8.32 from 65 intercept possessions. A very even contest in every respect this quarter. Collingwood has had one more disposal, one more clearance, one more inside 50 and three more contested possessions for the term. Both teams have kicked 1.4.10 apiece. Collingwood has outscored West Coast 3.2.20 to 1.1.7 from defensive 50 chains. The Magpies average 18 points per game from defensive 50 chains, ranked third in the AFL. After totalling just two disposals in the first half, Will HoskinElliott has had eight disposals and five contested possessions this quarter. Collingwood leads the tackle count 20 to 14 this quarter, after laying only 27 tackles in the first half. The Magpies have won the tackle count by nine per game this season, ranked No.1 in the competition. Will HoskinElliott has hit the post twice this quarter, the left post once and the right post once. West Coast leads uncontested possession 33 to 26 this quarter. It has been an area that Collingwood has controlled for much of the matchthe Magpies still lead by 19 in uncontested possession. West Coast already has six marks in the first two minutes of the third quarter. They will be happy if the rest of the term progresses in this fashion. 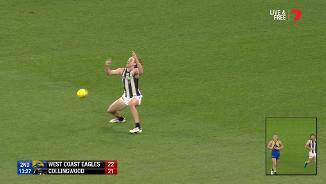 The Eagles have kicked 3.4.22 from forward 50 chains compared to just 1.0.6 from Collingwood. The Eagles have not lost a game this season when they have taken over 90 marks. They currently have 44 at half time. After conceding 33 marks to West Coast in the opening quarter, Collingwood restricted the Eagles to just 11 marks in the second term, their equalthird lowest tally in any quarter this season. Steele Sidebottom has been very influential in the second quarter with 10 disposals at 70 per cent efficiency, five contested possessions and three clearances. Collingwood leads centre bounce clearances eight to one for the match. Brodie Grundy has been dominant in the ruck all over the ground, totalling 21 hitouts, with six being to advantage, while also amassing nine disposals at 67 per cent efficiency. 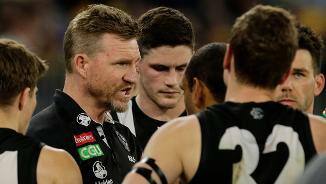 Collingwood's kicking efficiency would be of slight concern to Nathan Buckley. The Magpies are going at just 49 per cent by foot for the match, compared to West Coast's 64 per cent. Collingwood have eight of the first nine inside 50s of the term and six of the first seven clearances, enjoying 72 per cent time in forward half. They have converted this dominance into three goals. Collingwood are dominating contested possession 18 to seven to start the second quarter, while also leading clearances four to one and inside 50s five to one, kicking 2.0.12 to 0.1.1 over the time period. West Coast has outscored its opposition by a total of 183 points in second quarters this season, ranked No. 1. Both West Coast and Collingwood have won 15 of 22 second quarters this season, ranked equal No.1 in the home and away season. West Coast is kicking at 68 per cent efficiency compared to Collingwood's 54 per cent and they have taken 33 marks to 16. The Eagles average 101 marks per game this season, ranked No.1 in the competition. Adam Treloar is showing no ill effects from his eleven week layoff, totalling 10 disposals at 70 per cent efficiency, four contested possessions and two clearances in the opening term. Jeremy McGovern was enormous in the opening term for West Coast. He had eight disposals with seven coming via a mark. Of his seven marks, three were contested and four were from opposition kicks. McGovern had five intercept possessions in total. Collingwood are transitioning the ball well from defensive 50 into attack, generating five inside 50s from seven defensive 50 chains. with the Magpies kicking 1.2.8 from these chains. Jeremy McGovern has recorded three intercept possessions already that have launched two of West Coast's three goals. Eagles InterchangeBrad Sheppard and is possibly out for the game. West Coast has the game on their terms at the present, using its precision kicking game to full effect. The Eagles are going at 73 per cent by foot compared to Collingwood's 52 per cent and have taken 15 more marks than the Magpies already. West Coast are leading the contested possession 19 to 12, but are well on top in contested possession post clearances, leading 15 to seven. West Coast kick the ball more than any other side in the competition, recording 1.74 kicks for every handball this season, ranked No.1 in the competition. They currently have 24 kicks and just eight handballs, a kickto-handball ratio of three to one. When these two sides last met in Round 17, Mark Hutchings had the matchup on Steele Sidebottom, keeping him to 12 disposals in the 68 minutes the two were matched up on each other. Sidebottom has four disposals in the first six minutes tonight. The Eagles have scored 57 points per game from their intercepts this season, ranked fourth. Jeremy McGovern took 77 intercept marks across the home and away season, ranked No.1 in the competition. Collingwood has won the disposal count by 27 per game this season, ranked No.1 in the competition. Collingwood has won the clearance count by four per game this season, ranked No.1 and have scored 18 points per game from forward half clearances this season, also ranked No.1 in the competition. West Coast has scored from 29 per cent of its chains originating in the attacking midfield zone, ranked No.1 in the competition. Welcome to Optus Stadium for the West Coast Eagles v Collingwood Round 1 clash. WEST Coast has snatched an epic qualifying final victory and broken Collingwood hearts after downing the brave Magpies by 16 points in a classic contest at Optus Stadium on Saturday night. After trailing the visitors by 10 points at three-quarter time, the Eagles stormed home, inspired by some brilliance from twin towers Josh Kennedy and Jack Darling, to book a home preliminary final for the first time since 2015. West Coast booted five goals to one in the fourth quarter, running over the top of an under-siege Collingwood, despite losing vital defender Brad Sheppard to a potentially season-ending hamstring injury in the first term. 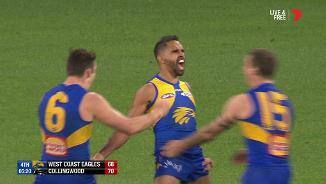 In an unforgettable final at WA's new football mecca, the Eagles' most experienced September campaigner Lewis Jetta was the hero, snapping a brilliant major with just over five minutes on the clock to put them ahead by four points. It was the 11th lead change of drama-packed encounter, and when Darling kicked his second goal soon after, the home side had done enough. At the final siren, Jack Redden sent the record 59,585-strong crowd into raptures by slotting his set shot, ensuring the Eagles ran out 12.14 (86) to 10.10 (70) winners. "The game itself was pretty hot for most of the night. 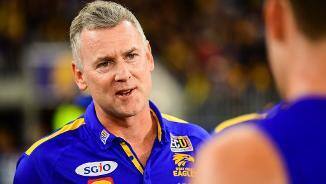 We made some mistakes, they made some mistakes," a relieved West Coast coach Adam Simpson said post-match. "The last quarter I thought we stood up in the contest and our leaders stood up. Kennedy and Darling in the front half, and the contest was probably an indicator the whole night what was happening. "I thought the boys stood up around the contest in the last." The margin didn’t do justice to the match, which ebbed and flowed from the opening bounce. Collingwood reclaimed the lead by two points at the 17-minute mark of the final term after Jordan De Goey slotted a clutch goal, and will be shattered after taking it up to West Coast with a frenetic, high-pressure game style. 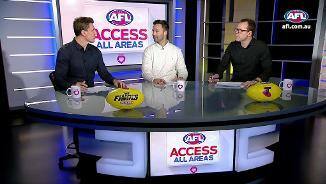 The Pies are now facing a cutthroat semi-final at the MCG against Greater Western Sydney, while the Eagles can sit back over the weekend off and await the victor of Hawthorn's do-or-die clash with Melbourne. It had been a fizzer of a finals series until Saturday night's bout, but West Coast and Collingwood more than made up for it with a thrilling and absorbing clash. EVERY EAGLE RATED How did they perform? The Eagles had all the momentum early, with finals debutant Liam Ryan overcoming early nerves and drilling two majors to hand the home side an 18-point break in the first term. 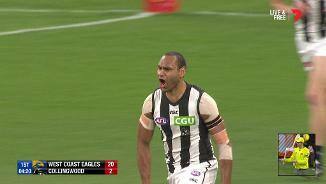 But Travis Varcoe, whose sister Margaret passed away last week, inspired the Pies with a deadeye finish from 50m out near the boundary before the break. Varcoe was swamped by his teammates after his superb finish, and after resetting at quarter-time, Collingwood got the game on its terms in the second quarter. West Coast hasn't lost a game all year when taking more than 90 marks and piled up 33 by quarter-time, with star defender Jeremy McGovern pulling in seven of his own. However, the Pies soon turned the game into a ground-level battle and took a three-point lead into half-time with a six-goal-to-three second term. The third quarter was almost unbearable, with both sides missing some golden opportunities in front of goal. There was no bigger culprit than returning star Kennedy, who missed three shots before finally finding the major opening. The rusty dual Coleman medallist was superbly held by Tyson Goldsack in his miraculous comeback game from a ruptured ACL only six months ago, but found some form in the second half and finished with two majors. 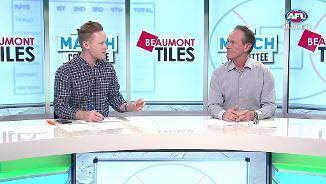 The Pies rolled the dice at the selection table, but gun midfielder Adam Treloar (24 disposals) was outstanding in his comeback from a rare double hamstring and defender Jeremy Howe contained Darling until the final quarter. Collingwood's All Australian duo Brodie Grundy (48 hit-outs, 18 disposals) and Steele Sidebottom (27 disposals, five clearances) were brilliant turning the tide after quarter-time, with strong support from Taylor Adams (26, two goals), Tom Phillips and Brayden Sier (26). Elliot Yeo (36, nine inside 50s) was the Eagles' best four-quarter performer in a midfield which matched the Pies for clearances (36-37). The Eagles won contested ball (169-163), with Dom Sheed (27, one goal), Luke Shuey (19) and Redden (32, one goal) stepping up in the second half to help send the Eagles through to the preliminary final. While West Coast breathed a massive sigh of relief at the final siren, Buckley was left lamenting losing contested possessions 32-46 in the tense last quarter, after having an edge most of the night. "We gave up some momentum at stoppage and got done at contested ball. That's where finals games largely exist," he said. 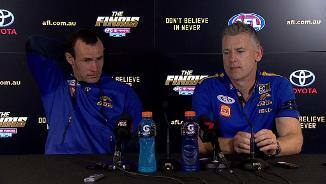 "We thought we were able to handle it for the most part, and we were in a position at three-quarter time to go ahead and finish the game off, but we didn't. "The opposition, you've got to give them credit for their persistence and what they were able to do out of stoppage. 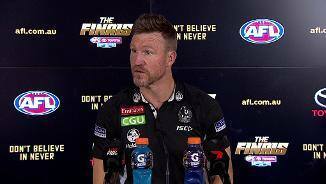 "We were well beaten in contested ball in that last quarter and put our backs under a fair bit of pressure as a result." EVERY MAGPIE RATED Who was the best? 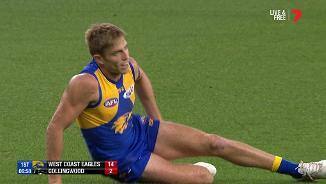 West Coast: Crucial Eagles defender Brad Sheppard looked to suffer a bad hamstring tear entering time-on in the first quarter after trying to soccer the ball off the ground. He needed assistance hobbling from the ground and his season looks to be over. West Coast small forward Willie Rioli was split open by a head clash with Levi Greenwood late in the final term. He needed stitches but will be fine for the preliminary final. 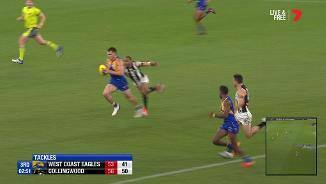 Collingwood: Midfield star Taylor Adams had to be helped by trainers early in the final term after copping Elliot Yeo's knee to his head, but he was soon back in the action. Brad Sheppard headed to the bench to receive treatment after this sequence. 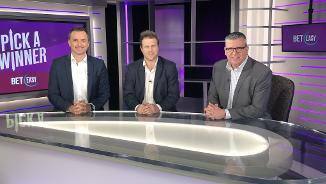 The Eagles have a fortnight to prepare for Melbourne or Hawthorn at Optus Stadium, but the Pies have to regroup quickly before facing the dangerous Giants in a do-or-die semi-final.